If you're pregnant or planning on having kids, and choose to proceed with the prenatal screening at 12 weeks for Down syndrome, and other serious illnesses, you may want to consider to find out if you (and your partner) are a carrier of the gene responsible for cystic fibrosis (CF). I found out that I was a carrier by chance after an abnormal ultrasound (with a different problem) during y second pregnancy. Cystic fibrosis is a genetic disease (quite serious) affecting mainly the digestive system and lungs. There is no cure for it. 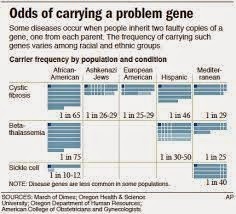 Carriers do not have the disease but can pass on the gene onto their children. If only one partner is a carrier, there is zero chance for the child to be born with cystic fibrosis; however he or she may be a carrier. If both partners are carriers, then there is a 25% chance that your child will have cystic fibrosis and a 50% that he or she will be a carrier. Prenatal genetic testing is used (drawing blood) to determine if the mother is a carrier. If the mother is a carrier (as it was in my case), the father will be tested as well. If you and your partner are both carriers, the pregnant mother can have an amnio done to diagnose or rule out CF in the fetus, and then you can make a more informative decision about the pregnancy. 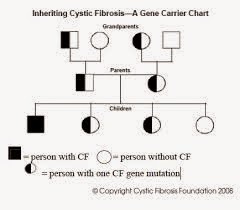 Also, I recently found out that once baby is born, the standard newborn screening tests to determine the presence of cystic fibrosis. More information on cystic fibrosis can be found at http://www.cysticfibrosis.ca/about-cf/what-is-cystic-fibrosis/.